The Beatles 50 Years Ago Today: August 24, 1967. Beatles Radio: The Beatles, Solos, Covers, Birthdays, News The Fab 4 and More! Encouraged by Pattie Harrison, The Beatles and their partners - minus Ringo and Maureen Starkey, whose second child Jason had been born five days previously - attended a lecture by Maharishi Mahesh Yogi at the Hilton Hotel on Park Lane, London. Tickets for the lecture cost seven shillings and sixpence each. Maharishi came to a hall in London and we all got tickets and sat down near the front row. There were a lot of flowers on the stage and he came on and sat cross-legged. And he looked great and he talked very well and started to explain, and I still think his idea is fine. The Harrisons had become interested in Eastern philosophy during a six-week holiday in Bombay towards the end of 1966. The following year Pattie attended a lecture on Transcendental Meditation at Caxton Hall, London, where she had been given her mantra. Inspired by her new discovery, she encouraged George to accompany her to Maharishi's lecture at the Hilton. Then, joy of joys, I discovered that Maharishi was coming to London in August to give a lecture at the Hilton Hotel. I was desperate to go, and George said he would come too. 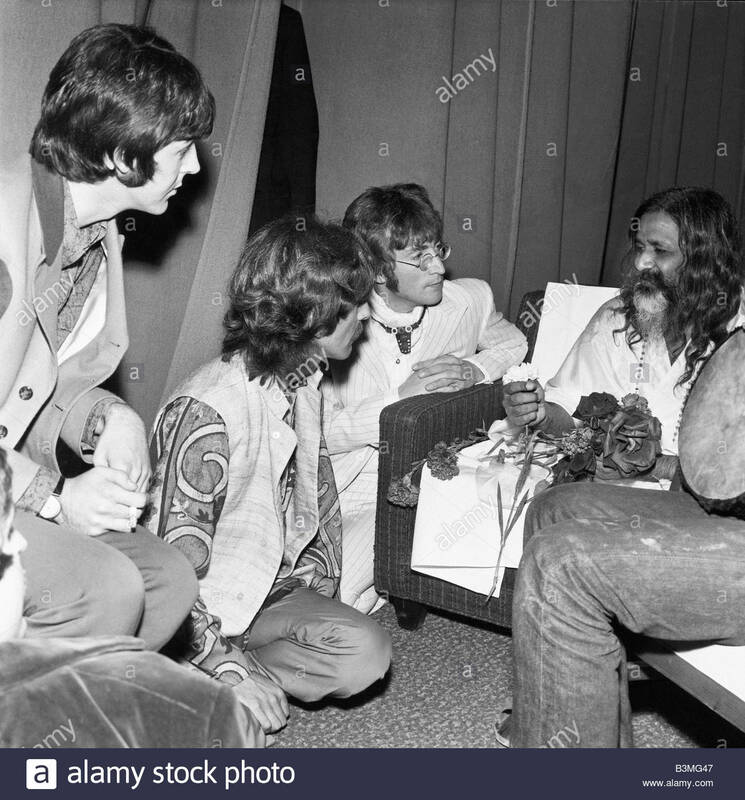 Paul had already heard of him and was interested, and in the end we all went - George, John, Paul, Ringo, Jane and I. Maharishi was every bit as impressive as I thought he would be, and we were spellbound. At the end we went to speak to him and he said we must go to Wales where he was running a ten-day summer conference of the Spiritual Regeneration Movement. It started in two days' time. We leapt at it.A press conference followed the lecture, after which a 90-minute private audience with Maharishi was held for Lennon, McCartney, Harrison and the rest of their party. The yogi's words left them keen to learn more, and they made arrangements to travel to Bangor, North Wales, the next day to attend the weekend seminar being held there.On August 24, all of us except Ringo attended the lecture, given by Maharishi at the Hilton Hotel. I got the tickets. I was actually after a mantra. I had got to the point where I thought I would like to meditate. I'd read about it and I knew I needed a mantra - a password to get through into the other world. And, as we always seemed to do everything together, John and Paul came with me.